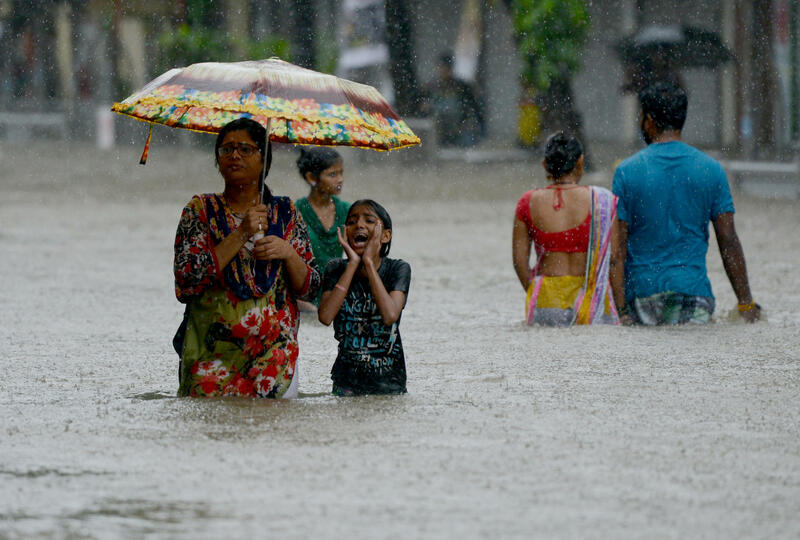 MUMBAI, India -- Torrential monsoon rains paralyzed India's financial capital Mumbai for a second day Wednesday as the streets turned into rivers and people waded through waist-deep waters. On Tuesday, the city received about 5 inches of rain and it's already hamstrung infrastructure collapsed. Public transport stopped and thousands of commuters were stranded in their offices overnight. India's monsoon season runs from June through September, and since it began this year, devastating floods have killed more than 1,000 people across South Asia and affected close to 40 million in northern India, southern Nepal and northern Bangladesh. The rains have led to wide-scale flooding in a broad arc stretching across the Himalayan foothills in the three countries, causing landslides, damaging roads and electric towers and washing away tens of thousands of homes and vast swathes of farmland. Commuter trains shut down, buses were half-submerged under water and even the deluged airport had to divert flights to other cities. By Wednesday morning, most trains were running but traffic remained chaotic. According to the Meteorological Department, more heavy rain was expected Wednesday and the local government asked all schools and colleges to shut down for a day. Every year the city struggles to cope with the annual monsoon deluge, drawing criticism about its poor planning. Heavy rain warnings have also been issued for other parts of Maharashtra state, of which Mumbai is the capital. A heavy rainfall alert has also been issued for parts of Maharashtra's neighboring states of Goa and Gujarat.